We are a trusted local. With widespread independently owned and operated Shed Boss outlets across Australia and New Zealand, we are industry leaders in the manufacture of quality steel sheds, garages, carports, patios, awnings, barns and workshops for domestic, rural, commercial and industrial uses. Shed Boss Fleurieu is an independently owned and operated family business that has been supporting the local industry and jobs since 2005. We take pride in our work, and it shows in everything we do. That's why we have an uncompromising attitude when it comes to our workmanship and delivering our customers timely service, premium quality Australian products and genuine value for money. Shed Boss sheds are Australian made. Our shed designs exceed the requirements of the BCA and Australian Standards, and is engineered specifically for your site conditions and usage needs. Plus, every shed is independently certified by two Australian structural engineers for absolute peace of mind. Quality has always been the core of Shed Boss. Our reputation as a leader in the shed industry is built upon offering a versatile range of 100% Australian quality certified steel structures with superior design, engineering and systems including patented Morinda Bracket® designs exclusive only to Shed Boss. ShedSafe. Build an asset, not a liability. Like your house, your shed should also be engineered specifically for your site. Every shed is different in terms of the site, exposure to the elements and distance from other buildings. Combining this data with other important information such as the intended use of your building and the localised wind speed, enables Shed Boss Fleurieu to determine your site specific wind speed and design specification. 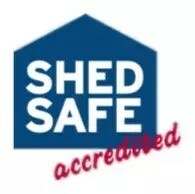 Shed Boss Fleurieu is ShedSafe Accredited - our designs have met all the ShedSafe criteria for tough Australian conditions, including coastal salinity and cyclone zones, with assurance that our buildings are engineered specifically for your site conditions and usage needs.... protecting your shed, its contents and the safety of people near it. By dealing direct with a licensed builder (BLD 236453) and qualified tradespeople – we can professionally and efficiently manage your complete project - from initial design and planning to council approvals and final construction.